Thinking back now on the Summer of 1965, I can remember so many places that have long since disappeared that were so important to me then. That summer resurrects one of my favorite memories because so much seemed to be happening. As a kid, the summers were important to us all; after a year of being shut up in the house, or playing in frigid temperatures, or rain, it was good to get out into the sun. 1965 was the first summer that I can recall where girls became acceptable and I often hung out with them. I was only ten, so this wasn't the boy-girl attraction thing, but rather an acceptance where we learned to interact with each other on meaningful levels. Some of the girls were good at sports, and were therefore likely candidates for team games. In general, the world was a big beautiful safe place where the days went on forever and the nights were spent outdoors until the late hours. By this time, we lived just off 88th and Holgate. Eastport plaza was just down a steep dirt hill, well within walking distance. 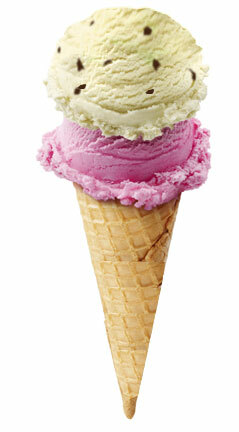 There was an Albertson's there that had an ice cream shop where you could get cones in the summertime. I really loved the raspberry cones, and the chocolate chip served on one of those waffle cone types-not the sugar cones-but the regular cones shaped like waffle cones. 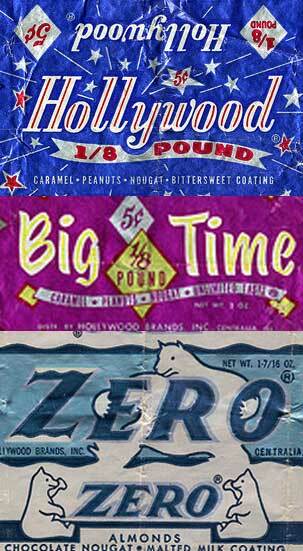 5 cent candy bars were more than an urban myth, and I remember buying some of my favorites for a nickel each. Hollywood, Big Time, and Zero bars were the ones I used to buy. Milk Shake bars were also my favorites long before it was popular to put them in the freezer and eat them frozen. Skateboards and music were more and more popular. The best songs were emerging, and I was getting old enough that the music actually mattered and made a strong difference to me. 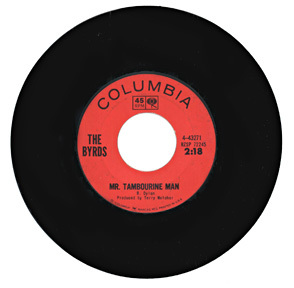 There is not one song that will bring back that scorching summer of '65 better than The Byrds' version of "Mr. Tambourine Man". The songs from the new Beatle's album "Help!" were, as usual, highly important and influential, not only to me, but everybody I knew. The songs "Help! ", "Ticket to Ride", and "You're Gonna Lose that Girl" were my favorites during this period. "California Girls" by the Beach Boys was also one of the best songs ever to come out of that beautiful summer.Herman's Hermits had a big hit with "I'm Henry the VIII, I Am" and Freddie and the Dreamers had everyone on the block doing "The Freddie". Considering that The Beatles had managed to churn out several hits a year, sharing the pop charts with them was a relatively difficult feat for many. A monstrously huge hit song came out of left field, and pulled the rug out from everybody. The song wasby The Rolling Stones and it was called "Satisfaction". That song had everybody in my neighborhood doing backflips! Whenever it came on the radio-which was often-it got cranked up loud until moms screamed for it to be turned back down. I still acquaint "Satisfaction" with that summer of '65, and the heat in the streets, the games, the flavors, the people, and the fun times we had. Later, the Stones hit us again with "The Last Time". By summer's end, there were 4 songs on my block that were important enough to cease all activity until they ended. They were: "Mr. Tambourine Man", "Ticket to Ride", "California Girls", and "Satisfaction". 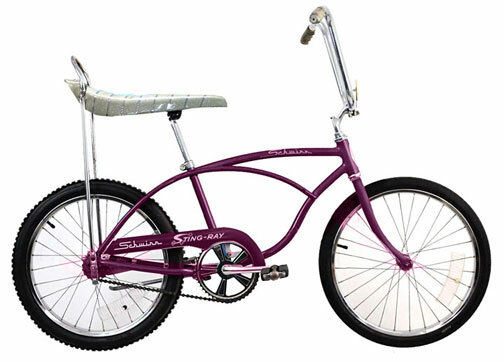 One of the first memories I have of the summer of 1965 would have to be the Schwinn "Stingray" bike. Most of us kids in the neighborhood had grown up with the standard bike, be it Schwinn, Huffy, or whatever, and had never seen anything like these before. These were the coolest street machines ever! Designed to resemble motorcycles, every kid on the block dreamed of, and drooled over these marvels of modern bike design. Mine was a purple job, modified like the one in the picture. Real men didn't use fenders or reflectors; I'd only left the chain guard on because it had the cool "Sting-Ray" logo on it. Eventually, the chain guard went also. Mine had the "Nobbie" tires on the back-supposedly for extra tread-but in reality, because they looked tough. At one point, I also had a "super slick" wide, slick tire in back. A lot of us guys would swap out bike parts because they weren't that expensive to buy, and it was great fun to trick out your ride. Mirrors were also cool. Parents loved them for the safety, and we loved them just for the coolness. Mirrors let you keep an eye out as to what was going on behind you. Skateboards were getting to be more commonplace, and the old Roller Derby board I used to have in 1964 got upgraded to one of the newer, sleeker, and more colorful models. 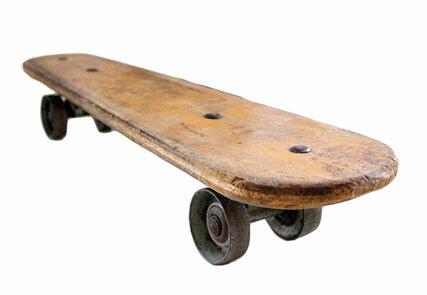 Soon, every kid on the block was putting roller wheels on their own slab of wood to create their own unique boards. One of the things I loved most about those days were the fact that we were always inventing, re-inventing, building, creating, and making the absolute best out of what we had. Customizing our stingrays, building forts, and "modding" up our skateboards were the best things ever. I recall one summer evening after having created our own skateboards out of plywood, heavy planking, and skateboard wheels, a bunch of us kids were out because it was so hot. We'd just hit the corner store for candy and pop, and were 60's-socializing out under the saffron glow of the corner street light. Sometimes my oldest brother would go out and smoke cigarettes and turn on his car radio while waiting for his friends to come over. It was pure Heaven when those muscle cars rolled up. We'd hear these great tunes that were new and fresh for the times. My other brother Pat, (the creative one), figured out how to open up the fire hydrants with a special wrench. Such fun that all was. My house crested a small, but steep slope that led to the backside of Marshall High School. Many of us would ride our new boards to the bottom, then make a hard spin out turn. None of us were skateboard champs, but we had a blast regardless. Serious toys were coming out, but the most powerfully influential toy for me was the infamous G.I. Joe Deep Sea Diver. I was a nut on underwater stuff anyway. Sea Hunt was one of my favorite shows, and snorkeling in my backyard pool with a mask and fins, was wildly fascinating to me. Therefore, having a new toy-a cross between a WWII solider-and someone who goes way deep into the ocean-was too good to be true. I did not have this right away. A neighbor kid whose parents had lots of money had just purchased it for him. I remember blowing on the whistle-type "depth gauge" while the diver was submerged in a big barrel of water. Watching the bubbles rise, and just imagining this awesome diver in my own backyard was too much! In my mind, I lived and breathed this new invention known as "G.I. Joe". Even the box was amazing, and the painting depicted the diver in the great depths of blue-green searching out some new adventure. G.I. Joe became a source of my most steadfast dedication in toys, and I later collected many versions, gear, and action toys related to him. Army men became more popular than ever for some reason during this long hot summer. I remember that a few of us neighbor guys would get together, and create elaborate outdoor setups with our army men. One kid actually created a foxhole with some weeds as a cover. He had a machine gunner in there. I was dutifully impressed with that. Around that time, we'd become delightfully aware of "Funny Faces" soft drinks. My favorites were Goofy Grape, Rootin-Tootin' Raspberry and *Choo-Choo Cherry. *(of note: Choo-Choo Cherry was originally "Chinese Cherry" and was quickly changed to a less racially descript name). Those were the great days of summer in the year 1965. These paragraphs only loosely describe some of the events that took place. When we were young, and full of ideas and ideals, daydreams and drama, and childish ambitions beyond the scope of anyone's understanding, we were probably the most alive than any other time in our lives. Oh, how I long for some of those days again; to walk to the corner store armed with a quarter in your pocket; twenty-five cents could buy so much then. Those were the great days of running through sprinklers, having water fights with hoses and buckets, eating ice cream cones, and listening to hit songs blasting from radios. It was a throbbing, pulsating life force in a world full of color and vivid dreams that could carry us to the moon and back. I see people around me now walking down the street staring at cellphones. Nobody talks to each other any more. Something is seriously missing, but for me, I'll look up into a summer sky, and for a few moments, minutes, or hours, I'll be transported back to that quiet little neighborhood bustling with kid-activity, and that beautiful summer of 1965.